Hot Vinyasa is a vigorous yoga in which the room is heated to body temperature, so your body is warmed, allowing for deeper stretching. The muscles, tendons and ligaments become soft and more flexible. The heat promotes sweating which is a method of cleansing to aid in the healing aspects of this yoga style. Please bring water and a towel. Level 2 classes are suitable for intermediate students. The basic postures are expanded to include more difficult variations and may be described with less detail. The class will flow at a faster pace and the asanas will be held longer. 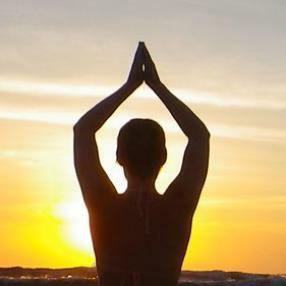 The classes introduce more advanced breathing techniques and concepts in yogic philosophy including the energetic body. Target your CORE in this flow class. Blocks, bands and Indo Yoga Boards might be used to challenge your strength and stability. This constantly evolving, fun spirited yet challenging class will motivate you to keep coming back. Cool not arctic room, from new to seasoned yogis this offers something for everyone. A challenging physical workout which focuses on the large muscle groups: Quads, Pecs, Calfs and Triceps. This is a moderate to fast paced class that incorporates calisthenics, light plyometrics and yoga for strength building, muscle tone and a detoxifying of the body. There is a very challenging core section at the center of class that will make you feel your "center of being." Practitioners of all levels are invited to this physically demanding practice. Get your happy hour on with all the benefits in half the time! The smooth, continuous flow deepens breathing, increases strength and endurance, and will test the edge of your balance and flexibility. All levels of practitioners are welcomed. Hot Vinyasa is a vigorous yoga where the room is heated to 90 degrees. This warms the body, allowing for deeper stretching. The muscles, tendons and ligaments become soft and more flexible. The heat promotes sweating which is a method of cleansing to aid in the healing aspects of this yoga style. Please bring water and a towel. Hot Vinyasa is a vigorous yoga in which the room is heated to 90 degrees, so your body is warmed, allowing for deeper stretching. The muscles, tendons and ligaments become soft and more flexible. The heat promotes sweating which is a method of cleansing to aid in the healing aspects of this yoga style. Please bring water and a towel.